Unlike many gods and goddesses, Isis began life as a mortal. I wanted her journey from queen, wife, and widow, to goddess and sorceress, mother and wrath, to show in her face. Once divine, the goddess was said to have hair of lapis lazuli and skin of gold, so I tried to keep gold and blue undertones wherever I could. Her son Horus is often described in ancient texts as blue-eyed, a trait perhaps owed to his mother. Genetically, ancient Egyptians are the same as their modern counterparts, but as with any population, recessive genes occurred here and there. (Interestingly, Isis and Osiris' brother Set is described as red-haired and green-eyed. Pharaoh Ramses II had auburn hair in his youth, and the funerary statue of the Fifth Dynasty wab priest Neferherenptah shows him with distinctly blue eyes). Isis has many crowns at her disposal, but I've always been fondest of her vulture crown. 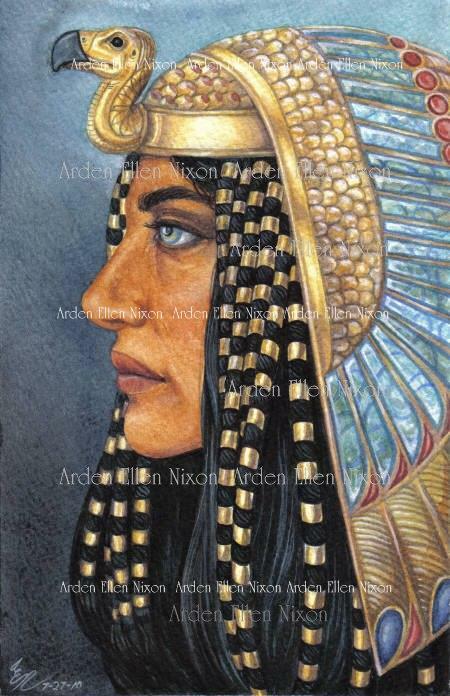 The Egyptians loved their turquoise (convicts and prisoners were often sent to the turquoise mines to work), so it figures prominently in her headdress, as does lapis and carnelian. No vulture crowns have survived time's trials, so I imagined this one with the help of one of my favorite books, Cyril Aldred's Jewels of the Pharaohs (Thames & Hudson, 1971). Isis' hair ornaments are modeled on those of the Twelfth Dynasty princess Sit-Hathor-Yunet.